Where will your favorite team finish on Sunday? 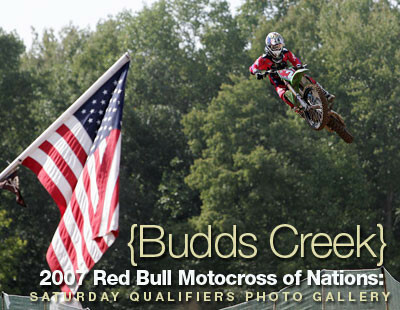 That remains to be seen, but in the meantime, you can click the following link to check out 31 photos covering Saturday's action at the 2007 Red Bull Motocross of Nations at Budds Creek, Maryland. The Monster Team USA squad of Carmichael, Villopoto, and Ferry put on a dominating display of talent on Saturday, with each rider sweeping their respective class win. Be sure to check back tomorrow as well, as we'll provide as many updates as we can throughout the day, and full post-race coverage on VitalMX.com.